Brian May is an undoubtedly accomplished guitarist, but he’s hardly renowned for good taste. 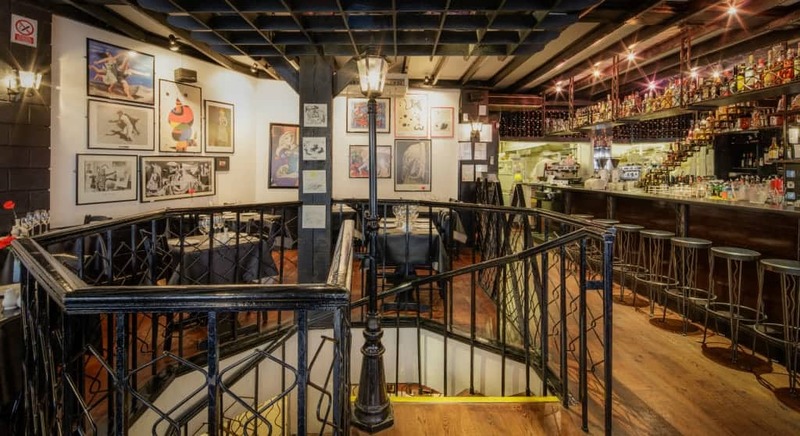 Yet according to their website, Mayfair tapas restaurant El Pirata (‘The Pirate’, in English) are very proud that the Queen guitarist once visited and said, “El Pirata rocks”. There’s also a testimonial from Johnny Depp, who apparently loves it here, and may or may not have visited in his Captain Jack Sparrow costume. Having been around for just under a quarter of a century, El Pirata is a delightfully informal spot that owes its success to “a vast choice of good Spanish food and wine served quickly by friendly waiters in an informal restaurant that feels more Madrid than Mayfair.” Inside, the restaurant is surprisingly busy for a Monday evening, decorated with prints from Spanish artists while the smell of shellfish and paella fills the air, punching us on the nose as soon as we walk through the door. There’s a charmingly convivial atmosphere, too, which is impossible to miss. The main tapas menu on offer during the evening is extensive, to say the least, split into eight sub-headings. Whilst tactically negotiating to narrow a gluttonous choice of dishes, we begin with a board of paper thin Iberico ham and a selection of cheeses, mostly made from pasteurised sheep milk and choose a bottle of Spanish Chardonnay. From the menu’s ‘meat’ heading, Riñones (£4.95) is a dish of kidneys stewed in sherry wine. Iron rich kidneys and sweet wine are best of friends (even though the same cannot be said for alcohol when teamed with human kidneys) and taste unsurprisingly sating in collaboration. The kidneys could do with a little less cooking, though it’s an otherwise pleasing dish. Lentejas (£4.95) – a stew of lentils, chorizo and pancetta is also pleasant. The lentil adds bulk while pigginess of paprika-heavy chorizo and pancetta adds remarkable depth of flavour. Personally, I love eels. From the once cheap creatures served with pie, mash and liquor in traditional pie and mash shops to the sweet, smoky grilled unagi popular in Japan. El Pirata serve a dish of baby eels (£8.65), which arrives in a terracotta pot like the ones used for side dishes at Nando’s. In the dish, there’s very little besides a large helping of spaghetti-thin eels, in sizzling oil that gives the illusion of movement, not unlike worms in a fishing bait box. The appearance is instantly unsettling, but what’s more; the dish has so little flavour that there’s nothing to justify the dish’s astoundingly unpleasant texture. Far better is a simple dish of octopus dressed with lashings of extra virgin olive oil and paprika (£8.75). Even though it’s served on a chopping board, it’s delicious. Another favourite of mine, octopus is fairly expensive to prepare at home and ridiculously easy to overcook and ruin. This particular beast is, nonetheless, cooked to perfection. Another pick from the seafood section of the menu, squid with black rice (£8.55) – coloured with squid ink – is saporous but enough to make my lips resemble Gene Simmons’. Like the octopus, however, the squid is cooked exceptionally well. Alas, the same cannot be said for calamari (£7.95) that should have been saved from the fryer at least one minute earlier. We finish with a dessert that’s promised to be “light” by one of the charming waiters to look after us. Vanilla ice cream is always a pleasant way to end a heavy meal, especially when it is made properly. Two scoops are served here with a generous glug of saccharine Pedro Ximenez sherry. El Pirata has a lot of redeeming qualities. As well as being amongst the most approachable restaurants in Mayfair, the space’s atmosphere is terrific. In addition, although some dishes need improvement, most of the food served is of a good standard and moderately priced. Just be sure to order the octopus. El Pirata can be found at 5-6 Down Street, London, W1J 7AQ. Previous PostIs pairing wine and food all it’s cracked up to be?